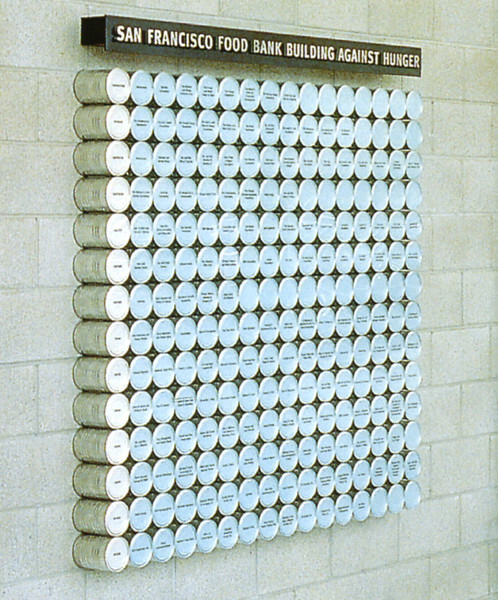 Most donor recognition installations in museums are really ways to say thanks. And who could argue with that? But you can thank someone with the equivalent of a cheap mass-produced card you grabbed on your way home, or with the donor recognition version of a homemade loaf of bread accompanied by a carefully chosen book inscribed to the recipient. 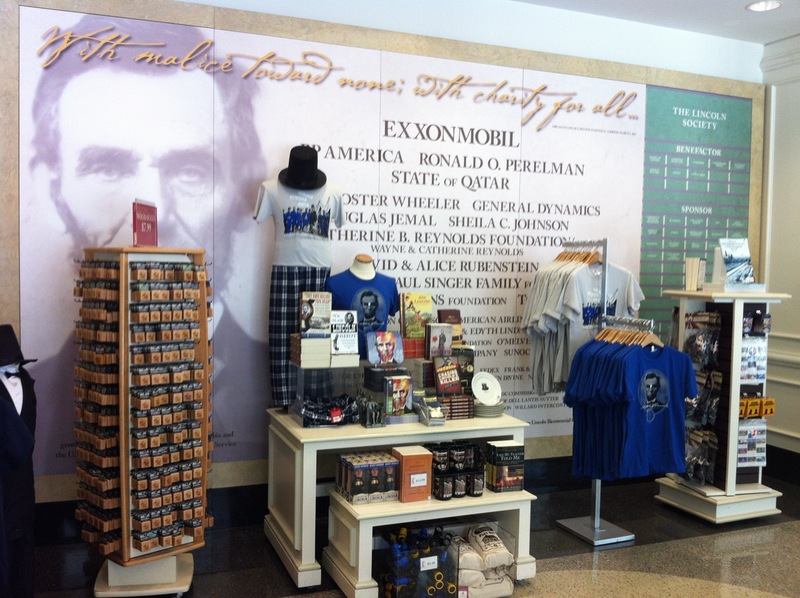 Last month I asked museum folks for images of interesting and thoughtful examples of donor recognition. I received an avalanche of images --- many more than I'll include in this post, so I've gathered all the images that I've received into a free PDF available for download from the POW! website. So let's take each of the six categories and show a few examples of each. I'm sure you've seen lots of bad examples of this donor recognition approach, but there is a lot to be said for the simplicity (and creative twists!) that can be employed using this technique. 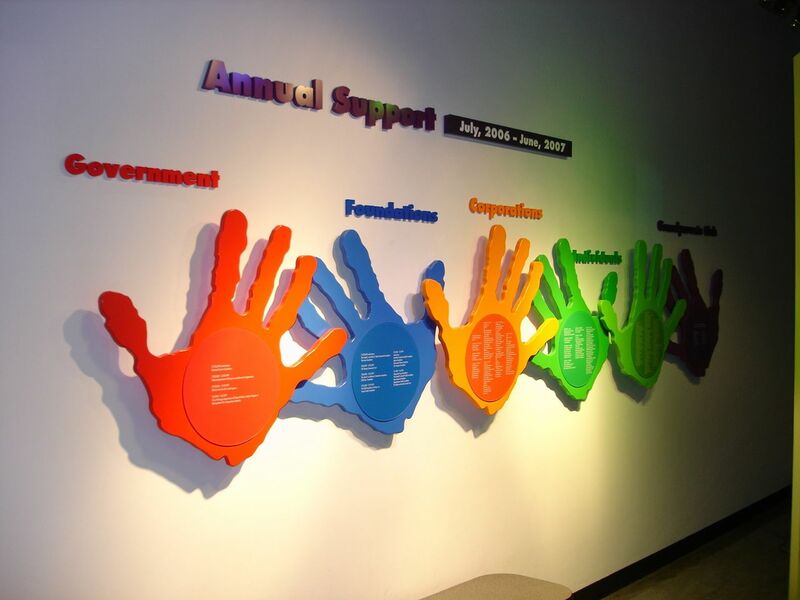 The image at the top of this post is a nice example of "helping hands" (but still essentially plaques) in this category from the Chicago Children's Museum. The next is a sert of back-lit elements designed by Skolnick A+D Partnership for the Children's Museum of Virginia --- The entire unit is essentially one big lightbox! 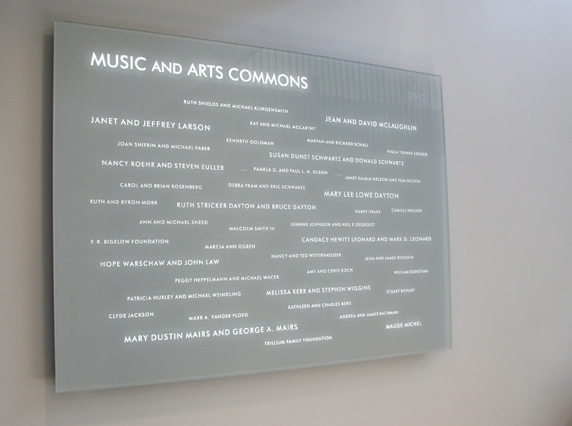 Light is also used as a strong element in the image below from Macalester College. The folks from Blasted Art used Rosco's Lite Pad product to create the glowing text. Lastly, I like this simple example from the MonDak Heritage Center. Just frames, but it does the job nicely. Sometimes donor recognition wants to be BIG, in an architectural sense, so interior or exterior walls are used --- and sometimes even floors! And the second from the Oakland Museum. They are both colorful and animate nicely what would otherwise be a big blank wall. Of course, even the best-laid donor recognition plans can get circumvented by operational issues! And lastly, here's a floor example from The National Museum of Nuclear Science and History. It's the Periodic Table with donors in each element. Several people sent examples of genre specific donor recognition designs. A popular motif is to use collection objects or images, especially in the case of Natural History Museums. Here is the Specimen Wall from the California Academy of Sciences. 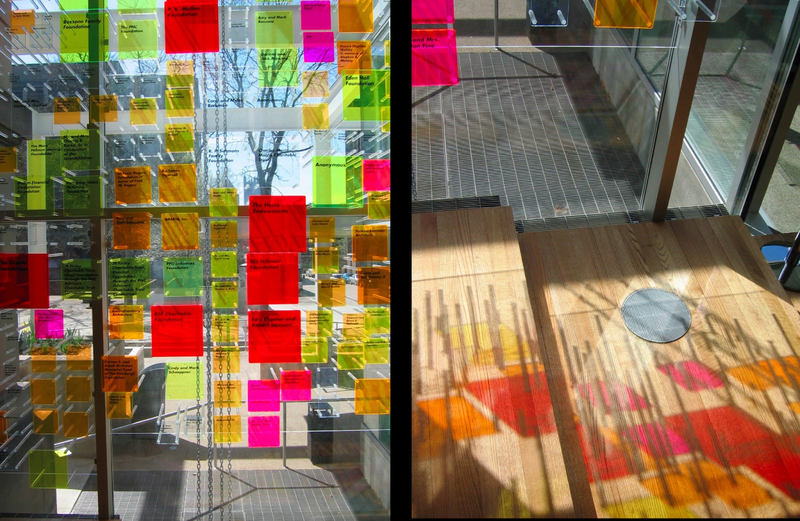 It's an elegant low-tech solution that features specimen reproductions encased in laminated glass. 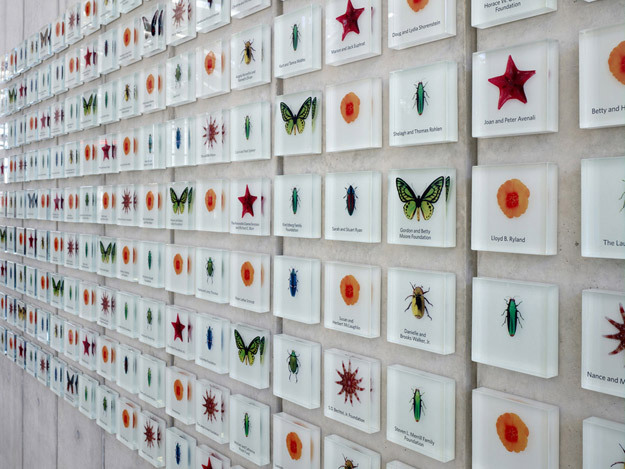 The wall was conceived by Kit Hinrichs and realized in collaboration with Kate Keating Associates, with fabrication by Martinelli Environmental Graphics and glass by Ostrom Glassworks. 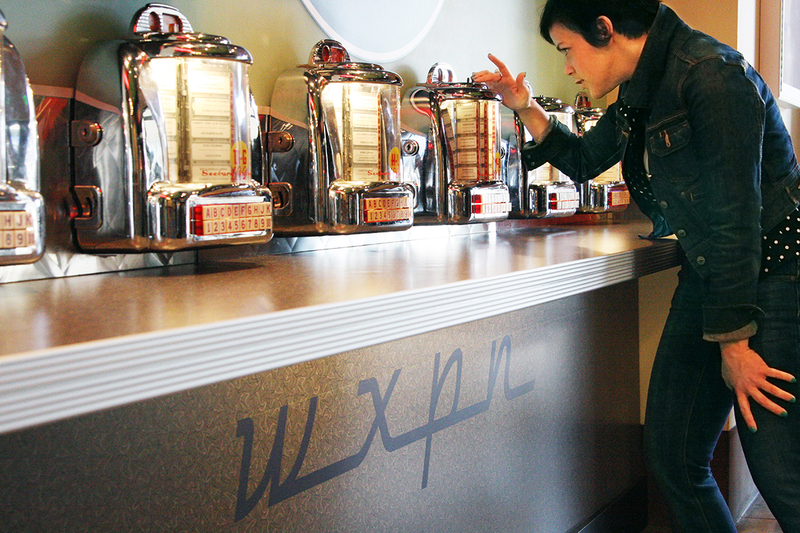 Here's a clever use of old school tabletop jukeboxes to recognize donors to radio station WXPN put together by Metcalfe Architecture & Design in Philadelphia. 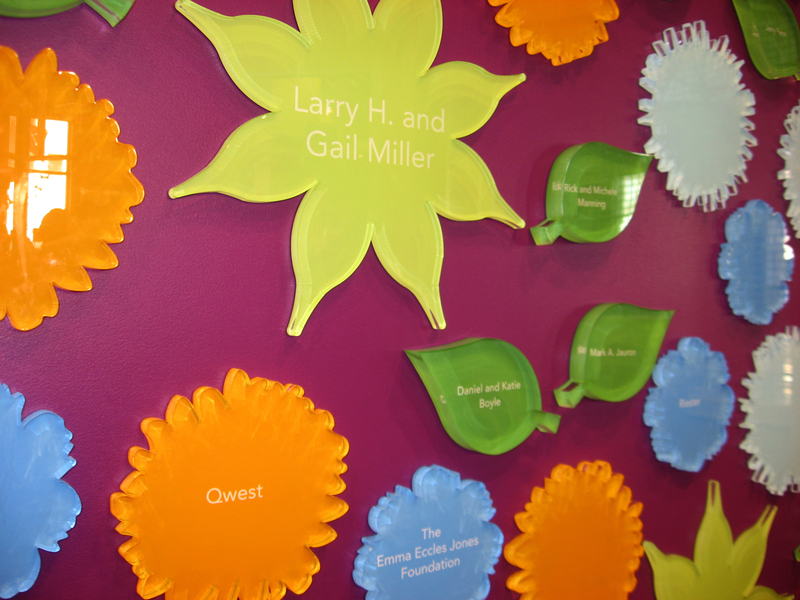 In the same way that interactive exhibits are fun and memorable, donor recognition can be too! 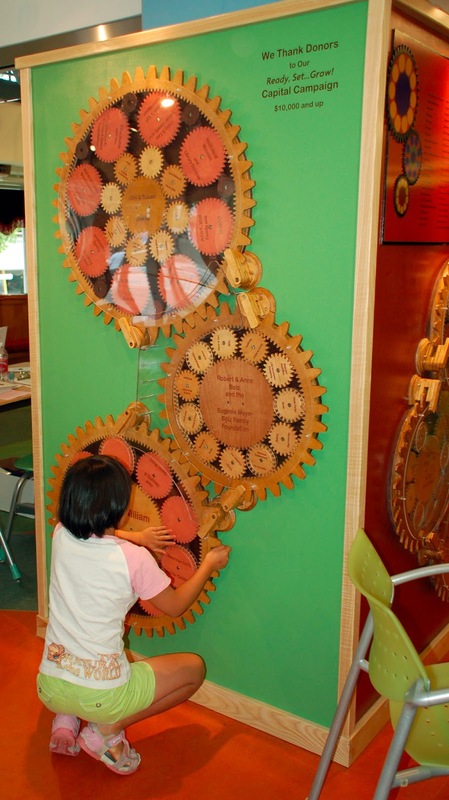 Gears are a popular motif in this regard. 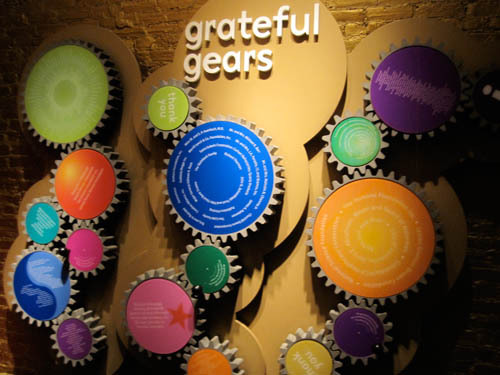 The first image (Grateful Gears) is from an installation at the Kentucky Science Center, while the second is from the Madison Children's Museum. 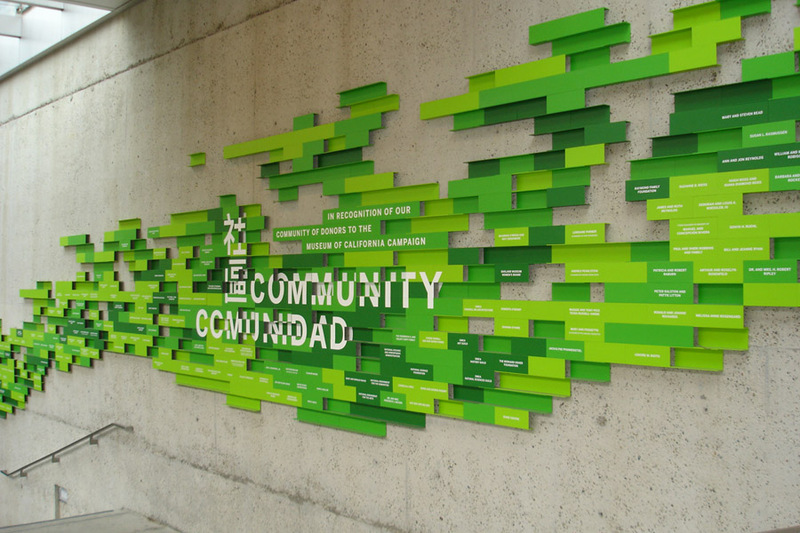 Sometimes the design element that gets people to stop and actually read the donor names are the unusual materials that the donor recognition piece is made of. If the materials relate to the institution itself, so much the better! The next is from the Museum Center at 5ive Points, in Cleveland Tennessee which has a strong history of copper mining. So this intricate donor recognition piece is made from copper! 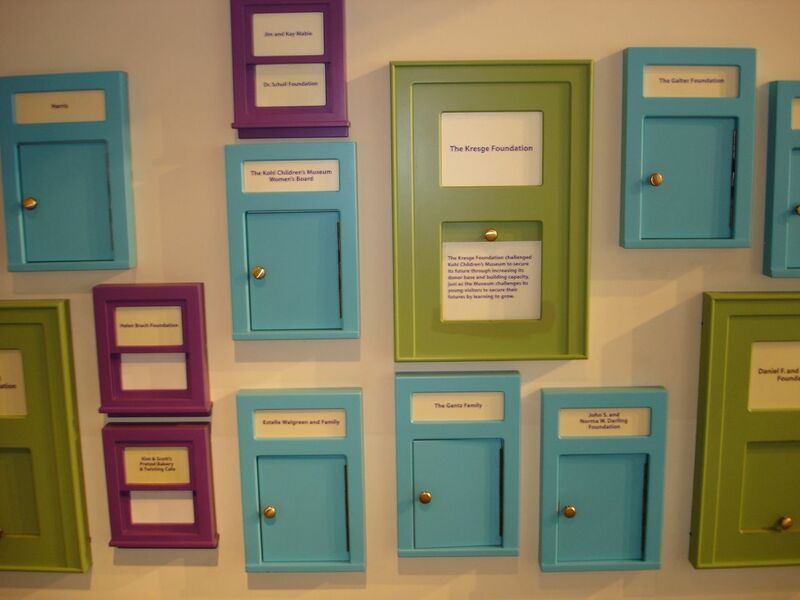 I love this clever use of miniature doors and windows at the Kohl Children's Museum. You can open doors and windows to reveal additional information about donors. 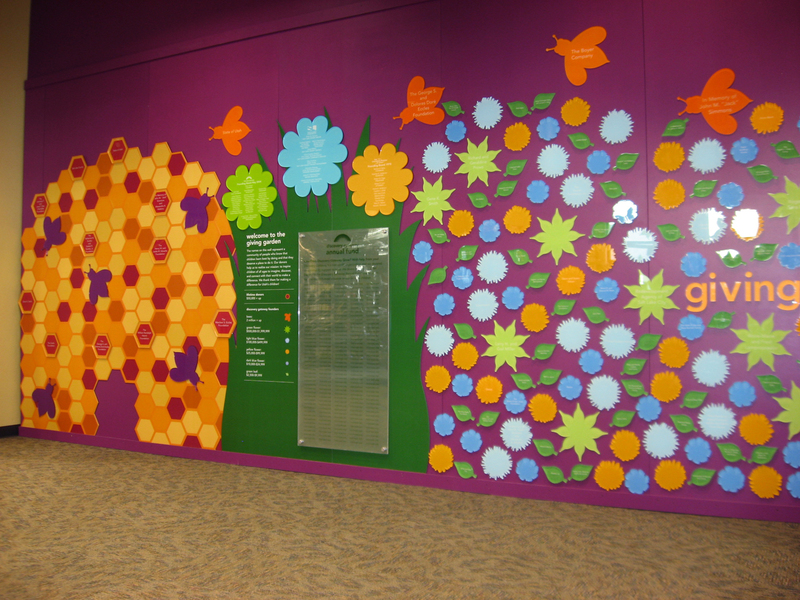 The last entry from this section is the truly striking three-dimensional "Donor Tree" from the Eureka Children's Museum in the UK. As with all museum installations, digital technology plays an increasing role --- even in Donor Devices. 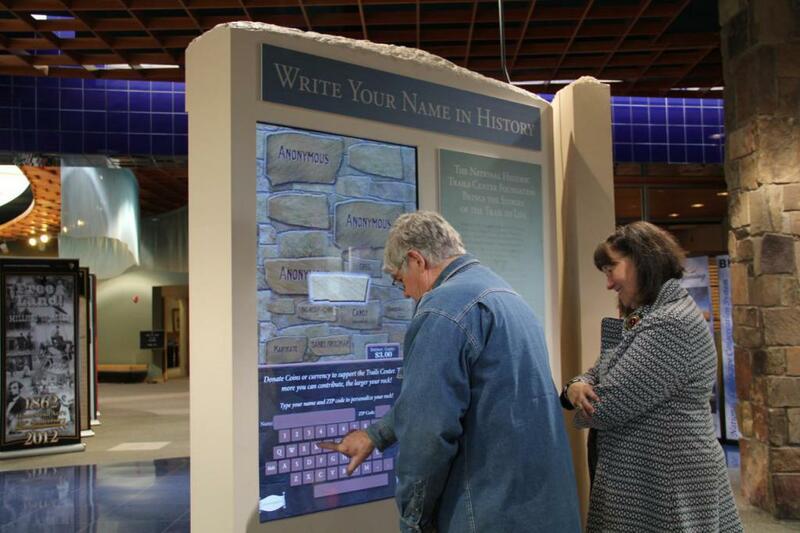 One unit that stood out was this digital donor recognition device at the National Historic Trails Center that solicits donations in real-time and puts up digital "rocks" on the rock wall screen of different sizes --- depending on the size of your donation, of course! A really neat idea that beats a dusty old donation box, hands down. As I mentioned earlier, these images are really the tip of the iceberg. So please check out the entire PDF of all the images I received by heading over to the "Free Exhibit Resources" section of my website. Also, if you have some other really good examples of donor recognition installations or devices, feel free to contact me and email them along, and I can share them in future ExhibiTricks posts.